· Performance and projection created to celebrate Birmingham’s 130th birthday as a City. · Performances including dance and spoken word directed by Steady Steadman. · Film projection and live drawing on Birmingham’s Council House telling the stories of the people who make the city created by Mohammed Ali, MBE. 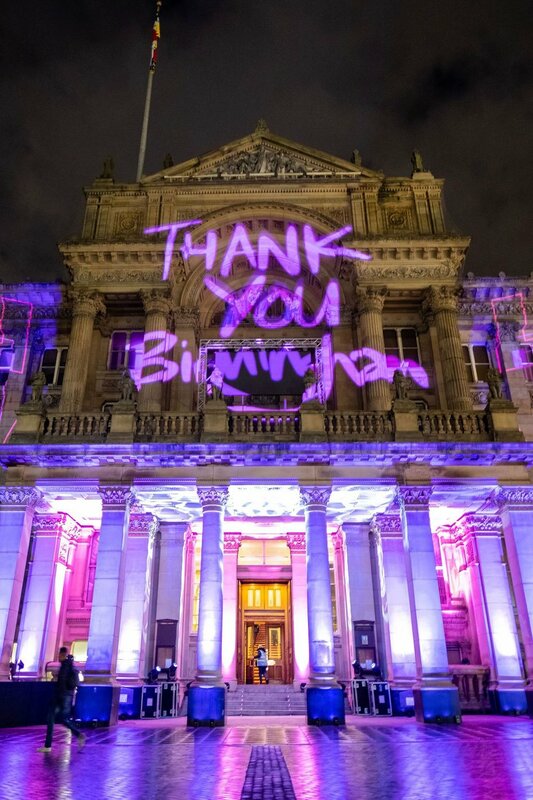 On Monday 14 January, 130 years after Birmingham was officially granted City status, Birmingham’s iconic Council House in Victoria Square was taken over with performance and projection as a celebration of City in a pop-event titled Brum 130: Beyond Bricks and Mortar. In January 1889, Birmingham was officially granted City status. In the 130 years that have followed, Birmingham has grown into a diverse, vibrant and confident place to live and work. In the special pop-up event which took place on 14 January, the spirit of the City and its people were celebrated with projections that gave a glimpse at Birmingham’s past and present alongside performances from the city’s thriving cultural scene. Steady Steadman directed a performance featuring artists and organisations representing the cultural talent in the region. The performance by Shenâi (vocalist), ACE Dance & Music (dance), Key Infinity (dance), Tarju Le’Sano (spoken word poet) and Marso (dancer) shared the performers’ own histories with the city and celebrated Birmingham today. Mohammed Ali MBE spent time ahead of the anniversary immersed in neighbourhoods across the city, filming people and places. The film, which was projected on to the Council House, went beyond bricks and mortar to tell the stories of the people who make the city of Birmingham. The projection also featured a live drawing element which saw Mohammed ‘graffiti’ thoughts and reflections of the city in words across the Council House. The event was produced by Culture Central on behalf of the City Board and supported by Birmingham City Council.